The only published map to exhibit the Jedediah Smith's seminal explorations in the American west. 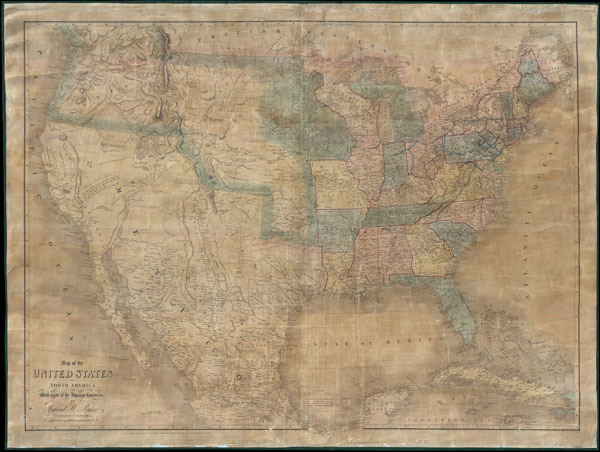 This is David H. Burr's all but unobtainable 1839 wall map of the United States. Burr's map is an accomplishment of staggering significance and is considered the culmination of one of the most dramatic and romantic periods in the mapping of the American West. It is further one of the most significant maps in the opening of the American West to the Gold Rush that, in just a few years, would transform the nation. Between the expedition of Louis and Clark in 1804 - 1806 and the work of Fremont in the 1840s, the exploration of the Transmississippi experienced a kind of dark age. Nevertheless, while no official teams were pushing cartography westward, trappers and fur traders were slowly penetrating the region. Most of these figures were illiterate and did little to extend cartographic knowledge. The exception was Jedediah Smith, a trapper whose wanderings in the west and subsequent cartographic innovations the historian C. I. Wheat considers a 'tour-de-force unprecedented and never equaled in the annals of Western exploration.' Smith spent roughly 9 years, between 1821 and 1830, exploring the Great Basin, the Sierra Nevada, the Rocky Mountains and the valleys of California, but sadly perished before his important work could be published. Smith's now lost map was taken by his partner and friend, Missouri Congressman William H. Ashely, and eventually made its way into the hands of David H. Burr, who was then composing his own important map of the United States - offered here. Smith's work must have seemed a revelation to Burr who struggled to reconcile conflicts between the mappings of Humboldt, Pike, Miera, and of course, Lewis and Clark. Burr, realizing the importance of Smith's work, incorporated it throughout his map, thus redefining the cartographic representation of the region. Shortly after Burr published this seminal map, Smith's original manuscript was lost, making Burr's map the sole printed representation of Smith's work. Curiously and somewhat inexplicably, this map never attained significant popularity in its day, leading to a very small publication run and, today, extreme rarity. Our survey of Burr's map must begin in the east. Burr, having just competed individual state plates for the 1835 issue of his New Universal Atlas had a relatively easy task of assembling the individual mappings into a cohesive whole. However, several elements do bear note. Burr identifies the nation's fledgling rail network, which is strongest in the northeast, with bold blue and red lines. In the state of Maine both the disputed British boundary, roughly along the 47th parallel, and the far northern boundary claimed by the state of Maine are noted. Heading west the territory becomes less settled and the character of the map changes. Particularly in Wisconsin and what would soon become Iowa, towns are few and far between, instead the map shifts its focus to notating American Indian Nations as well as the locations of forts, mills, lakes, portages, rapids, and waterfalls. Several land exchanges and treaties with various American Indian groups including the Sioux, the Sacs and Foxes, and the Chippewa are also identified. When Burr drew this map, Missouri was the westernmost state and the jumping point for most significant journeys westward. Beyond the borders of Missouri the territory is dominated by the American Indian Nations recently relocated to western lands by the Indian Removal Act of 1830. These includes the Osages, Cherokee, Creek and Choctaw. Further north the territories of the Otoes, Kansas, and Shawnees are noted. The map also identifies important landmarks on the route westward including the fur trapping forts on the Arkansas River (Gant and Bent), various springs, Pikes Peak, James Peak, and the Spanish Peaks. Where known military routes through the region are sketched in, including Major Long's Route and more importantly the Route of the Dragoons under Col. Dodge who, just a few years previous in 1834, initiated the first official contact between the U.S. Government and the Plains Indians. As Burr took up the pen to draw this map, Texas was in the process of declaring its 1836 independence from Mexico. Years earlier the Mexican government offered significant land grants to those with the means and interest to settle Texas - which in accordance to Humboldt, many considered to be a wasteland. Nonetheless, many citizens felt that the United States had been cheated of Texas, which according to some treaties should have been included in the lands acquired under the Louisiana Purchase. Burr notes this border, along the Rio Grande or Rio del Norte, as the 'Ancient Boundary of Louisiana as possessed by the French.' Consequently, when Mexico began offering grants, land hungry adventurers from north of the border seized the opportunity. The result is etched upon the Texan landscape to this day - Austin, Dewitt, McGloin, Burnett, Williams, McMullen, Wilson, Padilla, Chambers, and Cameron received grants to large swathes of territory that they were eager to develop. Many of these grants Burr notes with care, perhaps predicting the Mexican American War and the annexation of Texas that, as more expansionist Americans flooded into the newly independent region, seemed inevitable. Himself uncertain of the outcome of the Texas independence movement, Burr offers a curious compromise. On the Texas - U.S. border, Burr pens a distinct line with color coding that suggests a separate nation distinct from both Mexico and the United States. The Mexican border with Texas is, on the other hand, noted only as the aforementioned ancient Louisiana border. Ever the cartographic diplomat, Burr is thus able to appease both the U.S. recognition of an independent Texas and the Mexican denial of the same. To the north and west of Texas from the Rocky Mountains to the Columbia River to the modern Mexican border, Jedediah Smith's cartographic work comes to the fore. Clearly composing this map with Ashley's copy of the Smith map in hand, Burr delineates Jedediah's nine years of wandering throughout the region. Most of the copious notations and commentary are drawn directly from Smith's map, as are the corrected courses of many of the region's river systems. It was Smith's significant study of this vast area that ultimately united the discoveries of the 18th century Escalante-Miera map to the more contemporary mappings of Louis and Clark - finally brining the entire region into context. Smith also accomplished the first successful crossing of the Great Basin and the Sierra Nevada range. In the Sierra Nevadas he identifies Mount Rogers (likely Mt. Shasta) and, just to the South, Mt. Joseph. This map, via Smith, is the only published period example of Smith's trailblazing work in this region, the extent of which is far too broad and significant to fully embrace in this simple medium, but which ultimately played a significant role in the American expansion westward. (With regard to further research on Smith's cartographic significance we refer you to Wheat's classic study, Mapping the Transmississippi West where an unprecedented entire chapter is dedicated to Smith's travels) In 1849, when settlers and prospectors flooded into the region in response to the Gold Rush, they traveled along passages that 'Old Jed' Smith had trail-blazed years before as a trapper and fur trader. In the northwestern quadrant of the map Burr leaves the Oregon border open to the north, extending well into modern British Columbia. The British believed this territory fell into the land controlled by the Hudson Bay Company, while expansionist Americans asserted a claim to the region as far north as Russian America (Alaska). Five years following the Burr's construction of this map this conflict would escalate into the 54°40' dispute. The turmoil ultimately gave rise to slogans like 'Fifty-four Forty or Fight!' and the catchphrase 'Manifest Destiny.' However, exhausted with war following the Mexican-American conflict, the two sides finally signed the 1846 Oregon Treaty, settling the border along the current 49th parallel. Wheat considers this map 'in every respect a towering example especially in the Far West' and an essential chapter in the cartographic history of America. Burr composed this map in preparation for inclusion in his impossibly rare 1839 American Atlas. Most of the maps in the American Atlas were dissected and mounted linen - a common procedure at the time. This map, however, though clearly issued from the same printing plate, was a contemporaneous, but entirely independent issue. Though a few lucky libraries and museums, including the Library of Congress, the New York Public Library, and the David Rumsey Collection, do possess examples of this map from the American Atlas, none possess a wall map issue. We have been able to identify no other examples of this map in wall map format in any collection, public or private, nor, as far as our records indicate, has it ever been offered at auction or in any dealer catalog. This is a once in a lifetime collecting opportunity. was the first white man to cross the future state of Nevada, the first to traverse Utah from north to south and from west to east; the first American to enter California by the overland route, and so herald its change of masters; the first white man to scale the High Sierras, and the first to explore the Pacific hinterland from San Diego to the banks of the Columbia River. Unlike many of the trappers and fur traders active in this region, Smith not only had a lust for exploration, but also an extraordinary ability to piece together his own observations with previous work to form a cohesive whole. It was Smith who ultimately reconciled the work of Lewis and Clark with the cartography of Humboldt and Miera, and in the process filled in many of the blanks in between. Unfortunately, on his final journey, just nine years after his first, Smith was killed by a band of Mojave Indians. Smith intended to publish a book and map based upon his travels, but his death ended all such efforts. The manuscript map he did produce disappeared shortly after his own death. However, it comes down to us today via an 1839 map published by David H. Burr - who consulted an original manuscript of Smith's map while composing his important wall map of the United States. The map historian Carl Wheat considers Smith's work a "tour-de-force unprecedented and never equaled in the annals of Western exploration" and dedicates an entire chapter to his accomplishments in the seminal work, The Mapping of the Transmississippi West. Good. Full professional restoration and cleaning. Rebacked on new linen with new edging. Original rollers attached. Like most 19th century wall maps, it shows its age, but retains its character. Wheat, Carl Irving, Mapping of the Transmississippi West, 1540-1861, 441 (see also ibid. vol 2, pp 119-139). Phillips (atlases) 4525-1, 1379a-1. Rumsey 0104.001.